Parseq | Multi-channel services | We’re taking part in Byte Night! You are here:Home/Charity, News/We’re taking part in Byte Night! 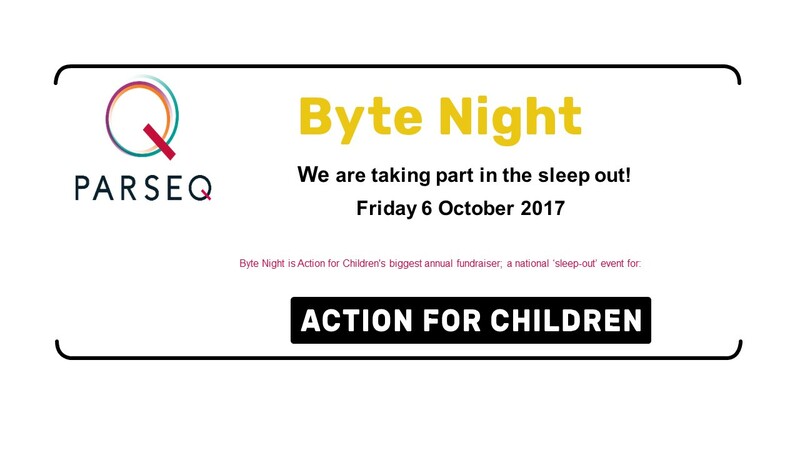 We’re proud to be supporting Byte Night which is Action for Children’s biggest annual fundraiser; a national sleep out event. Each year hundreds of likeminded people from the business and technology arena give up their beds for one night to help change the lives of vulnerable young people. Action for Children works with young people and their families every day. Byte Night helps young people who are homeless in the UK every year through no fault of their own. Business partners sponsoring Byte Night include FedEx, the Amber group, Greggs, Finastra, Secure Data Management and The big yellow self storage company. We thank you in advance for helping us achieve our goal to help prevent homelessness for young people and our mission to raise £7,500 for Action for Children.